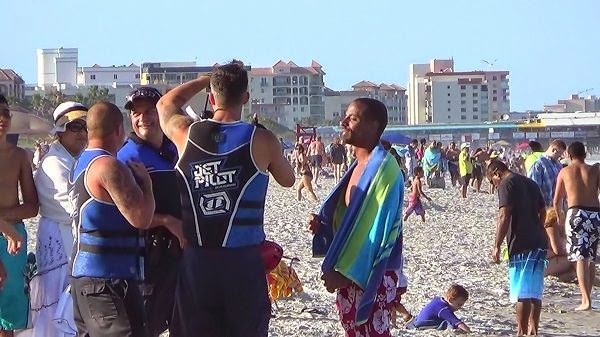 COCOA BEACH, Florida -- A swimmer caught in a strong rip current and swept out far from shore was rescued off of Cocoa Beach, Florida around 6 p.m. on Saturday. Shawn Huffman, 31, of Edgewater, Florida, was rescued from the ocean near Alan Shepard Park located at 200 E. Cocoa Beach Causeway in a joint effort by the Cocoa Beach Police and Fire Departments, and the Brevard County Sheriff’s Office. At 5:25 p.m., a Cocoa Beach Police Department Beach Ranger was on routine ATV patrol of the shore line when he observed Huffman 150-200 yards out in the water, then disappear. The Ranger immediately radioed for assistance. Officers arrived on-scene, and through binoculars, located Huffman who appeared to be in distress. The Brevard County Sheriff’s Office Aviation Unit was then requested to assist. Officers maintained visual contact from shore with Huffman until the Aviation Unit arrived and tossed a flotation device into the water to help Huffman stay afloat until rescuers could reach him. The entire rescue was caught on video. Cocoa Beach Fire personnel launched a watercraft to Huffman’s location and assisted him back to shore where he was subsequently transported via ambulance to a local hospital in stable condition. The National Weather Service had issued a Beach Hazard Statement for Saturday due to north-to-northwest winds which produced a stronger than normal southward-flowing longshore current. Longshore currents commonly occur when waves approach the shoreline at an angle. They can produce rip currents near a jetty or pier that can knock a person off a sandbar into deeper water.